Are you rowing this home school year?! If you are not familiar with the term, "rowing" it comes from the Five In A Row Curriculum. It's a literature based curriculum that uses a book to explore social studies, language arts, math, science, and art topics. We are loving it! This week we rowed, Katy and the Big Snow . 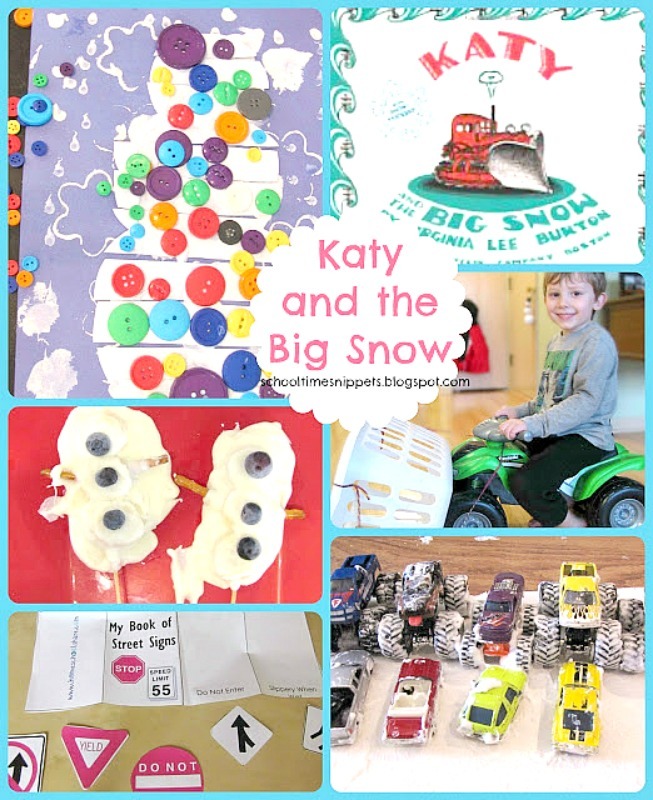 Katy and The Big Snow is about a hard working red tractor who "becomes a heroine as she finally gets a chance to work and fulfill her responsibilities" (summary from FIAR manual). We "rowed" another book by Virginia Lee Burton earlier in this school year; we read "Mike Mulligan and His Steam Shovel." Both books are full of charm; it's a no wonder both are considered classics. Using Beginning Geography, T learned the points of the compass. We have talked about cardinal directions before, so it was a bit of a review, too. To practice more with cardinal directions, we played "If You Were Katy." I placed several community location pictures, as well as signs to indicate N, S, E, W, around our living room. T rolled the die to find out where he was to go to. The highlight of our week, was our DIY snowplow! I attatched a hamper to his ride-on toy and made "snowballs" with rolled up socks!! This was a fabulous way to add in some pretend-play! And put those newly learned compass skills into action! Completed a Road Signs lapbook page from Homeschool Share. We are one page away from finishing up Explode the Code book 1 and I am just so proud of him! ETC combined with All About Spelling, really helped him gain confidence in blending his sounds together to read! I picked up a Little Critters "Play Ball" early readers book and he read most of it without my help! Finding beginning readers is tough! They are either too easy and/or a little bit too wordy and over-whelm him. 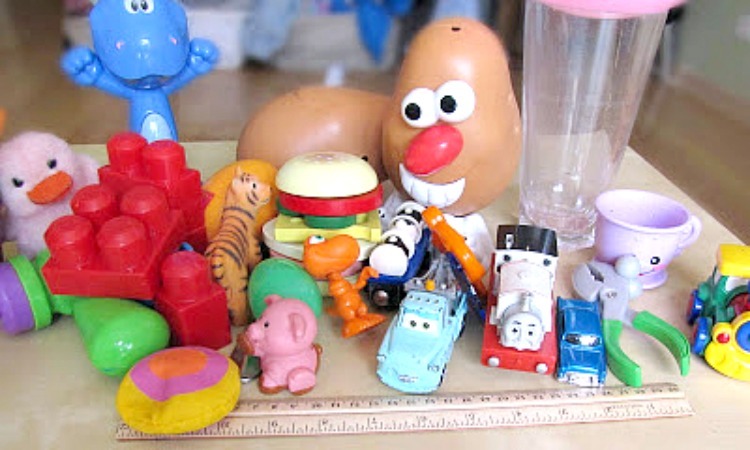 We revisited Personification; I gathered a bunch of toys and had T sort them into two piles: objects that showed some type of human characteristic and not-personified. Afterwords he placed eye stickers on a bunch of his toys and we made up stories together! He is such an animated story-teller, usually using actions rather than words to describe/ show something! I introduced measuring in inches and feet; my son really enjoys measuring things, so I pulled out a long piece of butcher paper from his art easel and we measured how much snow fell in the city of Geopolis. We measured 4 inches, 10 inches, 2 feet, 3 feet, and 5 feet. Then I made some snow paint and we covered the piece of paper! Afterwords, T had fun rolling his cars in the snow but unfortunately they all got "stuck" just like in the story-- but we couldn't find our Katy to help them out, so they just stayed there! I left T to feed Little Sis, but loved hearing him play with his cars. Five feet of snow is a lot!! Finally, for math, I found a website full of Kindergarten Math. We played "Measure with Paperclips," "Measure with Inches," "Which Tool to Measure With," and "Math Lingo"; after one of the measurement activities, you could "set off" fireworks and another you could build your own house. Definitely will be checking this site more more ideas! Snowman Puzzle: I cut a out a snowman shape and then cut it into strips. My son's job was to put it back together . Afterwords, I asked T if he wanted to add a couple of buttons, and a couple turned into a snowman COVERED in buttons! Well, I was hoping for one last snowfall... and it didn't come, so we just read a couple of books about snow. And, just for fun we made some yummy white chocolate covered banana snowmen-- YUM! I usually have our next book somewhat planned and I have nothing yet! I am thinking we will row "Clown of God" by Tomie de Paola to work in the rainbow/ St. Patrick's Day theme.... stay tuned! We spent a couple years "rowing" with all three Five In A Row volumes, check out our All Time Favorite Rows here!